Looking for hotels near Ethnographic Museum Plovdiv? Boutique Hotel Evmolpia is set in a traditional Bulgarian Rennaissance house in the heart of Plovdiv Old Town, and just a 2-minute walk from Kapana District. Located in the Plovdiv Center of Plovdiv, Kapana Vibes and Kapana Spirit has accommodations with seating area. Located 2297 feet from International Fair Plovdiv and in the central part of the city, Studio Ulpia offers accommodations in Plovdiv. Set next to the Old Town of Plovdiv, this air-conditioned apartments feature a terrace with city views. The units are 2953 feet from International Fair Plovdiv. Offering a casino and free WiFi, Vacation Apartment is located in the Plovdiv Center district in Plovdiv, a 17-minute walk from International Fair Plovdiv. Set in Plovdiv, the hotel is ideally located in a central area, within a 14-minute walk away from the International Fair of Plovdiv and just 1.9 mi away from international main road A1. The hotel has adequate parking and is in walking distance of the main pedestrian street in Plovdiv. Located in a renovated historical building dating back to the early 1900s, 0.6 mi from the Old Town and a 20-minute walk from the Plovdiv Central Railway Station, Villa Antica offers rooms, suites and... There was A/C which was a bonus.. Featuring a terrace and free WiFi, ФЛАМА РЕЗИДЕНТС is located in Plovdiv. Around an 18-minute walk from International Fair Plovdiv, the property is also close to Plovdiv Roman Stadium. Excellent location, clean and comfortable room! I really enjoyed my vacation! Highly recommend it! 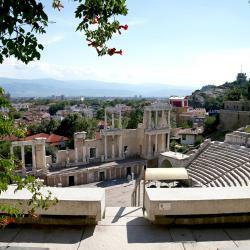 Set in the Plovdiv Center district of Plovdiv, Downtown Plovdiv Family Hotel is 1640 feet from Roman Theater Plovdiv. The rooms are spacious and very well equipped; the reception desk staff is very kind. Plovdiv’s Mini Hotel is located in Kapana neighborhood of craftsmen. The property is located just 328 feet from the Old Town, and a 10-minute walk from the Plovdiv International Fair. Friendly owner, great location, charming little hotel. City Hotel Plovdiv is set in a residential area near Maritsa River, a 5-minute drive from International Fair Plovdiv and the center of the city. Use of the gym, private parking and Wi-Fi is for free. The room is comfortable, cleane, nice balcony, great feeling. Really good hotel! Located a 5-minute walk from Plovdiv’s main shopping area, Hotel Noris offers a nonstop cocktail bar with summer terrace, free private parking and free Wi-Fi. Large Room. Large Balcony. Fascinating Lift. Helpful and pleasant hotel staff. Just 656 feet away from the international fairgrounds, Hotel BLVD 7 is located in the center of Plovdiv, less than 0.6 mi away from the historic old town. Everything was great!! Location, room, stuff all was exellent! Expo Hotel is located in the central part of Plovdiv, right next to one of the famous hills, and minutes away from the old town and the International Fair. Comfortable and clean rooms as well as friendly staff. Located in the Plovdiv city center and just 1640 feet from the main street and the old town, Business Hotel Plovdiv offers superb comfort, impeccable service and excellent facilities. Hotel is in a good location to walk throughout the city. 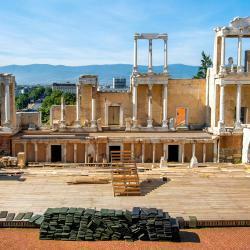 Hotels with great access to Ethnographic Museum Plovdiv! Located directly opposite Plovdiv’s International Fair, Avion Hotel features air-conditioned rooms with free Wi-Fi. Hotel Avion is located just a 10-minute walk from the city center. Exellent stay, people and Exellent breakfast! 5 stars! Hotel Ego is a modernly furnished hotel, located in the center of Plovdiv in the immediate vicinity of the main street and the old town. The room was fantastic. A bit old fashioned, all neat and tidy, furniture in great shape. Located in central Plovdiv, Hotel Real offers a restaurant and a garden with a play area for children. Room service is available 24 hours and Wi-Fi is free of charge throughout the hotel. Centrally located in Plovdiv, Hotel Odeon offers colorfully designed accommodations just 164 feet from the Main Square and 492 feet away from the Roman Theater Plovdiv. Free Wi-Fi is provided. Location is great. Small hotel with personality. Rooms are nice size and very cleans. Rather limited exhibitions for all the tourist hype about it. Rather limited exhibitions for all the tourist hype about it. Mostly just a bunch of old-timey farm stuff, like a homesteader museum in the Western US. It's a beautiful building, but possibly not worth the time and leva if one does not have much time.